Ruthie Mae Oglesby was born on March 1, 1930, in LaGrange, in Colorado County, Texas. She was the second youngest of four children born to the late Robert Oglesby and Rosetta Downey Oglesby. She attended Austin County High. She was a cook at many of the area restaurants and a successful manager of the Sycamore Inn in Sealy, Texas. Ruthie supported the East Side Foundation and was involved in other activities in the community. She loved to play dominos, bingo, traveling, watching her soap operas, game shows and her western movies. Ruthie favorite dish was fried chicken and Dr. Pepper. She also enjoyed visits from her step-grandsons, Shelton, III and Phillip during the summer months. Ruthie loved to dress and wear her hats and jewelry wherever she went. One of her favorite saying was “ that you buy clothes to wear not to keep in the closet”. And she did not mind telling you what was on her mind. In 1958, she was united in Holy Matrimony to Mr. Shelton William Dotson Sr. No children were blessed in this union. In addition to her parents, husband, daughter (Helen Ruth McDonald), three sisters, (Vernell Thomas, Bernice Gonzales, Birdie Miller) and six brothers, (Raymond Glenn, Eddie Glenn, Lee George Glenn, Lee Porter Blackmon, Henry Blackmon, and Robert Blackmon) preceded her in death. 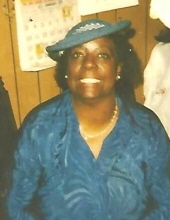 Those left to cherish memories of her are her sister, Ella Glenn, brother, Loyd Glenn (Gloria Glenn), stepsons; Shelton W. Dotson, Jr., (Thelma), Houston, Texas and Alvin S. Dotson, Sr., ( Marilyn), Lancaster, Texas; four step-grandsons; Shelton W. Dotson, III, Phillip Sheffield, Arlo Dotson, Alvin Dotson, II, one, step-granddaughter, Alvinette D. Dotson, a special niece, Patricia Joiner, a goddaughter, Vanessa Flores and a host of nieces, nephews and other relatives and friends who will remember her joy for life. To send flowers or a remembrance gift to the family of Ruthie Mae Dotson, please visit our Tribute Store. "Email Address" would like to share the life celebration of Ruthie Mae Dotson. Click on the "link" to go to share a favorite memory or leave a condolence message for the family.